Grand Theft Auto V is currently selling at $14.99, approximately $0.89 higher than average, giving a potential saving of $0.30 right now. With a lowest price of $9.73 and an average of $14.10 it is selling on the high end of its usual range. Price volatility is 3.42% (meaning it changes a few times a week), so you might have to wait a while for the price to drop. Right now this product is a recommended 'ok deal'. 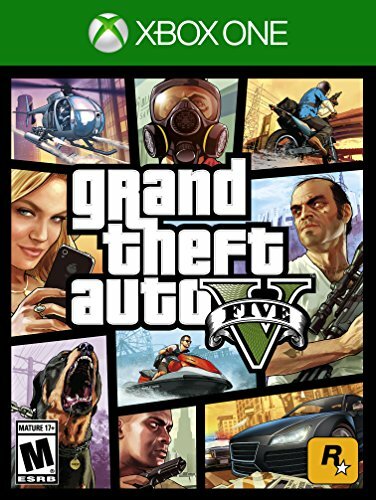 Compare the current price, savings (in dollars & percent) and Buy Ratings for the top Xbox One Games that are closely related to Grand Theft Auto V.
Here is how Grand Theft Auto V compares with other leading Xbox One Games. Experience Rockstar Games' critically acclaimed open world game, Grand Theft Auto V.When a young street hustler, a retired bank robber and a terrifying psychopath find themselves entangled with some of the most frightening and deranged elements of the criminal underworld, the U.S. government and the entertainment industry, they must pull off a series of dangerous heists to survive in a ruthless city in which they can trust nobody, least of all each other.Explore the stunning world of Los Santos and Blaine County in the ultimate Grand Theft Auto V experience, featuring a range of technical upgrades and enhancements for new and returning players. In addition to increased draw distances and higher resolution, players can expect a range of additions and improvements including: New weapons, vehicles and activities Additional wildlife Denser traffic New foliage system Enhanced damage and weather effects, and much more Grand Theft Auto V also comes with Grand Theft Auto Online, the dynamic and ever-evolving Grand Theft Auto universe with online play for up to 30 players, including all existing gameplay upgrades and content released since the launch of Grand Theft Auto Online. Rise through the ranks to become a CEO of a criminal empire by trading contraband or form a motorcycle club and rule the streets; pull off complex co-operative Heists or enter radical, adrenaline-fueled Stunt Races; compete in unique Adversary modes; or create your own content to play and share with the Grand Theft Auto Community. SPECIAL CONTENT FOR RETURNING PLAYERS†Players returning from the PS3™ and Xbox 360 versions get special access to a host of content on PS4™ including rare versions of classic vehicles to collect from across the Grand Theft Auto series such as the Dukes, the Dodo Seaplane and a faster, more maneuverable Blimp; activities including wildlife photography and new shooting range challenges, new weapons and more.†Special access content requires Rockstar Games Social Club account. Visit rockstargames.com/v/bonuscontent for details. FeaturesThe biggest, most dynamic and most diverse open world ever created and now packed with layers of new detail.Grand Theft Auto V blends storytelling and gameplay in new ways as players repeatedly jump in and out of the lives of the game's three lead characters, playing all sides of the game's interwoven story.Grand Theft Auto V also comes with Grand Theft Auto Online, the dynamic and ever-evolving Grand Theft Auto universe for multiple players.